Gondola Sign Topper | Boot System | Magnetic and Adhesive Sign Holders | Clip Strip Corp. Magnetic or Adhesive "Boot" bases hold upright signage channels that grip your sign. Choose from two types of signage channels, at two heights: 12" or 18". Make your signs any length and attach them securely and easily to any surface, via magnetic or adhesive mount. Create product categories with signs that span the width of your store fixture. Can also be used to create aisle violator/flag position signs on uprights. Clip Strip Corp.’s Sign Holder Boot System™ is an ideal way to display retail messages to consumers off Gondola Shelving units or any metal surface areas for the magnetic version or any other surface including metal for our adheisve mount boot. Signage can be displayed horizontally or vertically depending on whether the “Boot” is attached to an upright or a top cap. It is manufactured to hold sizes of virtually any length across your retail point of purchase unit. The Boot System™ can also be utilized for counter tops or any flat surface throughout a store. The Gondola Sign Topper, Boot System™ is made of very durable ABS plastic, its magnetic grip is very strong; making for one well-built sign holder, and use the adhesive mount where needed. It is easy to secure your signage right into its built-in channels which can hold virtually any shape retail signage. Signs up to 1/4" thick can be accommodated. Let Clip Strip Corp. be your go-to Point of Purchase vendor for Gondola Signage or any Sign Holder products that you may require! Contact us today, and be communicating with your customers tomorrow. 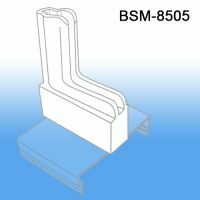 Minimum quantity for "Boot System™ Magnetic Base Sign Holder, BSM-8507" is 1. 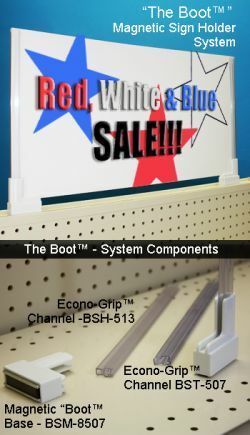 Minimum quantity for "12" Boot System™ Econo-Grip™ Sign Channel, BSH-513" is 10. 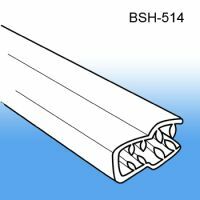 Minimum quantity for "18" Boot System™ Econo-Grip™ Sign Channel, BSH-514" is 10. Minimum quantity for "12" Boot System™ Thin Poster Sign Channel, BST-507" is 10. 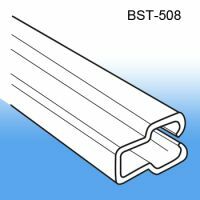 Minimum quantity for "18" Boot System™ Thin Poster Sign Channel, BST-508" is 10.